A parliamentary report of 1777 recorded a parish workhouse in operation at Mansfield with accommodation for up to 56 inmates. In 1828, Pigot's Directory records that the Mansfield workhouse stood on Nottingham Road, with William Johnson as its master. After 1837, the site was turned into small cottages and named Meadow Square. The buildings survived until the 1950s. The old Mansfield parish workhouse on Nottingham Road. Courtesy of John Vanags / Old Mansfield Society. County of Nottingham: Blidworth, Hucknall under Hathwaite, Mansfield (5), Mansfield Woodhouse, Skegby, Sokeholme, Sutton in Ashfield (2), Tevershall, Warsop. Later additions: Fulwood (from 1861), Haywood Oaks (from 1861), Lindhurst (from 1861). County of Derby: Ault-Hucknell, Blackwell, Pleasley, Pinxton, Scarcliffe, South Normanton, Tibshelf, Upper Langwith. Later additions: Glapwell (from 1837), Shirebrook (from 1903). The population falling within the Union at the 1831 census had been 25,400 — ranging from Sokeholme (population 68) to Mansfield itself (9,426). The average annual poor-rate expenditure for the period 1833-35 had been £7,430 or 5s.10d. per head. In 1837, the hosiery trade suffered a slump resulting in about 300 men being unemployed and destitute. 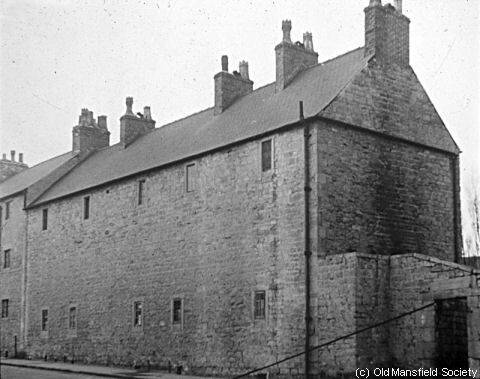 The new Mansfield Union workhouse was not yet ready so the Board of Guardians applied to the Poor Law Commissioners for permission to distribute out-relief. The Commissioners' reply was that out-relief must only be given in return for work, or if this was not practicable, then bread and soup could be distributed to those whom the Guardians had determined were truly destitute. However, the Guardians reinstated a practice dating from before the 1834 Act. They provided supplies of cotton-twist and set the men to work in their regular trade of making stockings (which because of the depression would probably be unsaleable). Following dire warnings from the Commissioners, the Guardians proposed that the unemployed men be provided with meals and a weekly allowance of 5d. per day or 2s.6d. a week. Not satisfied with this, the men angrily demanded — and got — twice this allowance. Assistant Commissioner Edward Gulson then visited the Union to try and sort out a solution. The Guardians agreed to end stocking-making and instead provide work in the levelling of a hill near the town. An angry mob barracked the meeting and Gulson departed under threats of physical violence. In fact, stocking-making resumed and was subsidized by a private subscription fund. To confine outdoor relief for the able-bodied to those in the stocking-making trade. To withhold relief from those in partial employment. To offer the workhouse to single persons and families of two. To require heads of families receiving relief to perform stone-breaking at the workhouse from 7am to 5pm. Food was to be provided, and other members of the family were to attend at the workhouse at 11am daily to take away food (12oz. bread and 1 pint of soup per person). In 1882, the sum of £15,000 was spent on additions and improvements to the buildings, with RF Vallance engaged as architect. A new 84-bed infirmary block was erected at the west of the workhouse. Baths were installed in the workhouse, the dining-hall was heightened, and a new drainage system was constructed for the site. A new vagrants' ward was also erected. Mansfield 1882 infirmary block from the north-west, 2001. Mansfield 1882 infirmary block from the south-east, 2001. A hospital for 70 patients was added further to the west in 1898. An isolation block and tuberculosis ward were completed in 1903. The site layout in 1899 is shown below. 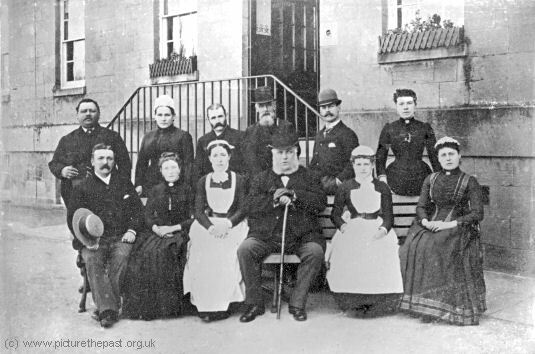 The picture below shows the Mansfield workhouse staff in around 1900. The central figure in the front row is Samuel White Skelton, Chairman of the Guardians from 1899 to 1905. At the left of the front row is J. G. Hammond, the Master, an ex-Army man; fond of decorating the facade with flowers, he had itinerant pavement artists decorate the walls. Mrs. Annie Hammond, at the far right of the front tow, retired in 1928 after 40 years service, carrying on as virtual Master after her husband's death in 1915. Mansfield Board of Guardians, date unknown. The workhouse later became Mansfield Poor Law Institution and after 1939 as Mansfield County Institution. 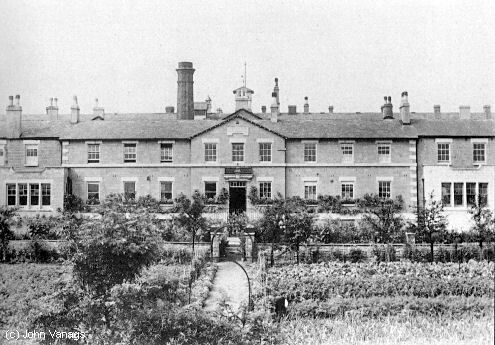 The workhouse infirmary later formed part of the Victoria Hospital which developed on the site to the west of the workhouse. The hospital is now Mansfield Community Hospital. The former workhouse building has been demolished. The 1882 infirmary was used for administrative purposes until its demolition in 2007. From around 1906, the Mansfield Union operated several scattered homes for the accommodation of pauper children. A home for 30 girls was located at West Lodge, Chesterfield Road, Mansfield, and one for 12 boys at Rock House, Ratcliffe Gate, Mansfield. A home is also believed to have existed at Brownlow Road, Mansfield. Nottinghamshire Archives and Southwell Diocesan Record Office, County House, Castle Meadow Road, Nottingham NG2 1AG. Holdings include: Guardians' minute books (1838-1930); Cottage Homes committee minutes (1906-21); Cottage Homes creed register (1913-25); etc. Thanks to John Vanags for picturec of workhouse building. 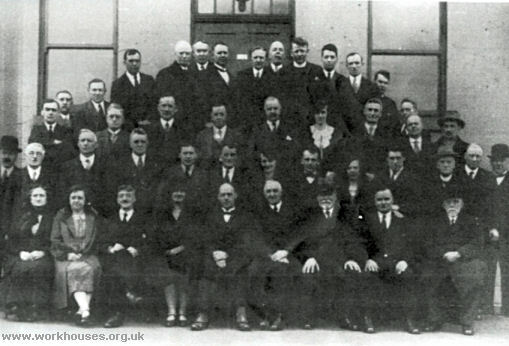 Picture of Mansfield workhouse staff is by kind permission of www.picturethepast.org.uk and Nottinghamshire Local Studies.